So, yes, when the unthinkable happens, offer your thoughts and prayers. Do it with all sincerity. But recognize the truth that that’s not enough. You can’t just stop there. Ask for wisdom from the God who knows all, who feels our pain, who already knows ways we need to change. Ask for guidance in showing compassion and offering meaningful help. Ask for direction in channeling your anger and frustration and despair in productive ways that will make these tragedies happen less often. 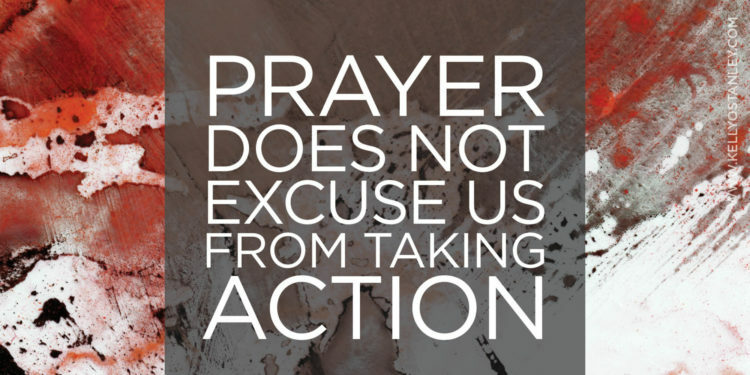 Ask God what you can do to help. Ask God to forgive us for letting things get to this point. Ask God to heal the minds and tortured souls who think hurting people is the answer to their pain. Ask God to show the gun lovers the distinction between guns for hunting and personal protection and guns that shatter the lives of countless innocent people, and to help our lawmakers find the right levels of compromise to protect our individual rights while also protecting those we love (which are also those that God loves—every single one. There are no exceptions.). This is a prayer for the non-controversial, invisible Christian. For you, the one who flies under the radar. Who doesn’t cry persecution, or rejoice when another self-professed Christian trounces someone with his religion. Who doesn’t jump to conclusions or resort to petty name-calling and judgment. Who reads the Bible as a life-giving source of sustenance and not as a weapon with which to bludgeon unbelievers. Who prays, hopes, trusts, holds her tongue, and errs on the side of love. Always love. This is for the one who accepts those who are not like her and doesn’t let the differences threaten her own beliefs. The one whose faith is not diminished when faced with opposition. The one whose faith is, in fact, strengthened by different perspectives. The one who is never reactive, combative, hateful, or exclusionary. The one I want to be. Thank You for who You are. For being the God of the humble, the loving, and the generous. Oh, how You must grieve at the self-righteous anger, the vicious and vile words spewed across the Internet (and in person), the misguided and hurtful actions perpetrated by people using Your name. Your holy, lovely, truly righteous name. Oh, Lord, forgive us all. The hatred has gotten way too much attention, and the true beauty of this life has been overlooked. A life filled with You radiates beauty and goodness. It is saturated with peace and kindness. Please, Lord, reach down to Your people. The ones who are quietly mourning the damage being done to Your name and to their faith. Reward them for their steadfastness by giving them an increasingly fulfilling, authentic experience with You. Whisper into their ears as they sleep peacefully at night. Nudge them, gently, when an opportunity to serve appears in front of them. Soothe their souls with fresh knowledge of Your magnaminous, all-consuming love. Every day, renew their strength. Show them new heights of grace and new depths of generosity. Flood them with love, with an abundance of goodness and a sense of contentment beyond their wildest dreams. Let them feel You, see You, hear You, and know You. 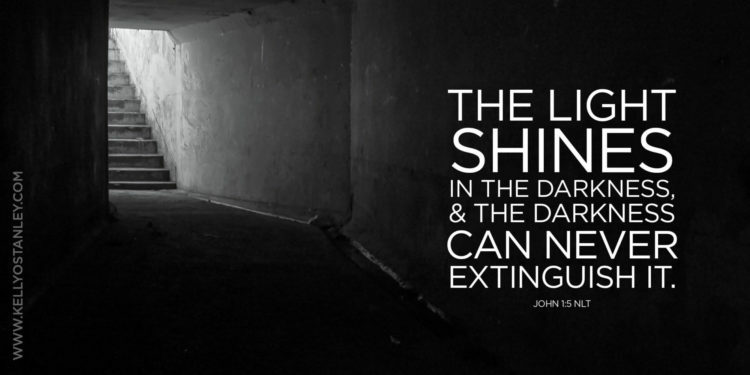 Shine so brightly into their lives that there will be no darkness left to be seen—anywhere. Radiate truth and goodness. Overflow their lives with Your Spirit, and let that be what the world knows of You. Reveal Yourself through the most humble and gentle of souls. We want to see You. 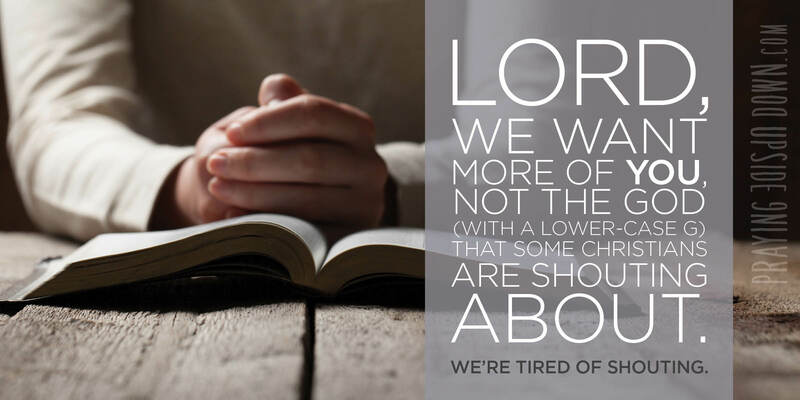 We want more of You, not the god (with a lower-case G) that some Christians are shouting about. We’re tired of shouting. We want the God who whispers and yet is mighty. The One who is holy. The One who saves lives, who redeems and doesn’t destroy. The One who is truly worthy of all that we have to offer. The One who is big enough, capable enough, and present enough to change us—and to change the world. Lord, help me be true to You and not get caught in the opinions and troubles of the world. Let me hold on to the Truth. To the most gentle, wondrous One of all. Help me never, ever let go of You. Amen. Perspective: an artistic technique used to portray depth, to project the illusion of a three-dimensional world onto a two-dimensional surface. In perspective, the straight edges of any object follow lines that eventually converge at infinity. Normally, this point of convergence is along the horizon. When grief is trying to claw its way out of your heart, shredding your soul as it fights for dominance, when something unspeakably tragic happens, when it’s big and shocking and awful and overwhelming, words fail. Thank God we don’t need words to pray, that He hears us anyway. Because right now my words are broken, stilted, choked, strangled with pain. This morning my daughter’s friend Mike died in a car accident on his way to the high school. A bright, shining boy. Scholar, athlete, friend. On top of that, he participated in show choir and school musicals and national anti-drug campaigns. His twin brother was driving the truck; neither wore seat belts, and now one is dead and one is alive. Our little community is in shock. Youth pastors and counselors showed up at schools, at homes. Parents opened their doors to roomfuls of grieving kids. Friends delivered food to these gatherings of kids, who are banding together in an effort to make sense of it. But they won’t. They can’t. All they can do is be together in an effort to share this load that is too heavy, that isn’t right, that isn’t fair. As a parent, I want to shelter my 16-year-old daughter, shield her from having to feel this pain, having to embark down this road of questioning and aching and sorrowing. Her heart is too tender. This shouldn’t happen. But, dammit, it did. Lives changed forever. And for what? Another friend of this same daughter has been in and out of court hearings and meetings with Child Protective Services all week. The kids got tired of the abuse, and when the dad hurt the younger sister this time, the brother called the cops. This is a sweet, sparkling girl who has spent a lot of time with our family. A lovely, vibrant young woman of strong character, bearing the weight of responsibility for her siblings. I had no clue all this was going on, yet now I’m hearing tales of parents with addictions, physical abuse, hateful threats and hurtful words and hiding in fear that someone would find out. I burst into tears of relief at the news that they got to go to foster care. Got to. I’m fairly close to the situation but not close enough to be right in the center of it. But, even from where I’m standing, it’s tearing me apart, from the inside out. My dad had a procedure today to burn off pre-cancer cells in his esophagus. My mom died of cancer less than two years ago, so the tests and waiting and words tossed around by doctors have been scary. The wife of my dad’s good friend, who’s battled cancer for years but outlived mom, passed away this week. With Dad, they caught it in time, right before the label changed from dysplasia to cancer, but today’s procedure is pretty tough and apparently very painful, and the recovery is longer and more limiting than expected. It’s something he’ll likely have to repeat, on and off, for the rest of his life. On days like this, when the meanings are lost and the emotions are jumbled and hope is battered and it is all just too much, all we can do is stand. The words may not come. How do you find hope? How do you go on? How do you pray? What could you even ask for that could matter? You don’t know whether to lash out at God or curl up under His sheltering wing. You don’t know whether to scream at Him or cry with Him. You just don’t know. Because nobody can know. Nobody can do this, nobody can bear it. Nobody on their own power, at least. There’s only One with the strength to carry it. Only One with the depth to understand it. Only One who can see that this is not the end. And that One is not you. Or me. So what do we do? It may not always seem to be true, but there is always hope. There is always more. There is always something good. Sometimes we can’t see it, and in times like this we certainly can’t begin to wrap our heads around it. All we can do is point ourselves in that general direction, aiming our broken selves towards the Source of hope. Beaming up our pain, trusting that He can absorb it, and that when it returns to us, it will be forever changed by the enormity of the love He has for us, soothing our shredded souls as it floods back in. Filling us, healing us. Restoring us. The only thing you can do, when your heart is broken and the tears won’t dry up, is turn your face to the horizon. Our perspective is temporal, limited, but God’s perspective is eternal. And one thing that artistic perspective and the eternal perspective have in common is this: all lines converge at the horizon. And that is where we have to look, because that is where we will find God.